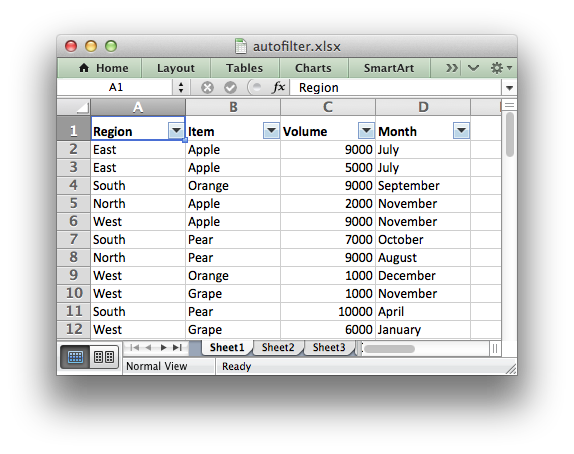 An autofilter in Excel is a way of filtering a 2D range of data based on some simple criteria. worksheet.autofilter(0, 0, 10, 3)  # Same as above. The autofilter() defines the cell range that the filter applies to and creates drop-down selectors in the heading row. In order to filter out data it is necessary to apply some criteria to the columns using either the filter_column() or filter_column_list() methods. It isn’t sufficient to just specify the filter condition. You must also hide any rows that don’t match the filter condition. Rows are hidden using the set_row() hidden parameter. XlsxWriter cannot filter rows automatically since this isn’t part of the file format. # ignored and can be any string that adds clarity to the expression. 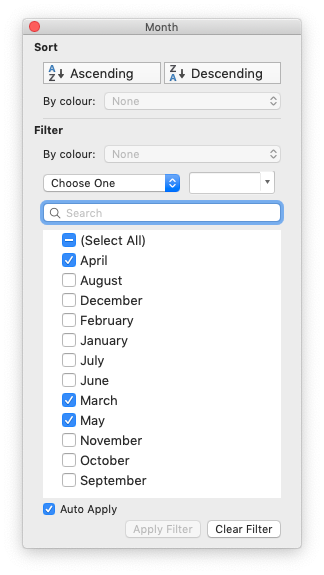 # Hide the rows that don't match the filter criteria. # Check for rows that match the filter. # Row matches the filter, display the row as normal. # We need to hide rows that don't match the filter. # Move on to the next worksheet row. The column parameter can either be a zero indexed column number or a string column name. You can also use '*' to match any character or number and '?' to match any single character or number. No other regular expression quantifier is supported by Excel’s filters. Excel’s regular expression characters can be escaped using '~'. A filter condition can only be applied to a column in a range specified by the autofilter() method. Prior to Excel 2007 it was only possible to have either 1 or 2 filter conditions such as the ones shown above in the filter_column() method. As explained above, it isn’t sufficient to just specify filters. You must also hide any rows that don’t match the filter condition. See Example: Applying Autofilters for a full example of all these features.